Every year, Salesforce’s Dreamforce conference grows, taking over the Moscone Center and the four blocks surrounding it. This year, more than 170,000 people converged on San Francisco to attend the event, build relationships with partners and customers, and enjoy the many parties that Salesforce partners host across the city. This year, CEO Marc Benioff’s keynote focused on connectivity, sustainability, and values. Everyone is familiar with the first three industrial revolutions. First, it was steam power in the late 18th–early 19th century, then electricity in the early 20th century. The rise of computers in the 1980s comprised the third industrial revolution, a revolution characterized by a fusion of technologies that blurs the lines between the physical, digital, and biological spheres. But now, we are in the fourth industrial revolution—connectivity. Cloud computing and artificial intelligence have overhauled how companies think about doing business. Two feature reveals at Dreamforce showcase Salesforce’s answer to the connectivity revolution: Customer 360 and Einstein Voice Assistant. Customer 360 is a new cross-cloud technology that brings together Marketing, Commerce, and Service Cloud to engage the customer and help with customer resolution. Powered by Customer 360, Marketing Cloud will be able to trigger abandoned shopping cart journeys that originate in Commerce Cloud. And customer profiles, Commerce Cloud orders, shopping cart data, and the ability to order for the customer will all be stored in the Service Cloud Agent Console and powered by Customer 360. This free feature is expected to roll out to customers in 2019. Einstein Voice Assistant allows sales reps to “talk” to Salesforce and update records using voice. This will enable sales reps to create tasks, update records in between meetings, and sync contacts into the record’s details. A second related product, Einstein Voice Bots, will enable Salesforce users to build their own branded voice-activated assistants. This product is currently still in beta, as well. In the week before Dreamforce, Salesforce worked closely with the Global Climate Action Summit to focus on reducing the carbon footprint across the globe. Salesforce has committed to conserving resources, sourcing responsibly, and reducing overall waste in the workplace. 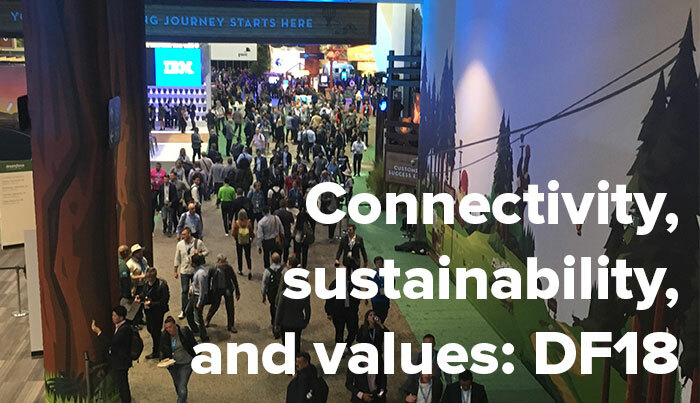 Dreamforce kicked off this new initiative with the offering of reusable water bottles, lanyard recycling stations, recycling volunteers, green transportation, and compostable packaging for food. Salesforce, along with 21 other tech companies, has signed the Step Up Declaration to decarbonize by 2050. In a time of environmental encroachment, embattled political stances, and socioeconomic uncertainty, Benioff posits that monumental change rests on the shoulders of today’s companies. The values of companies not only drive profit with today’s audiences and customers, but they also drive movements within society. Each company has to listen to society, Benioff said. But many companies are not listening to their key stakeholders, not listening to their customers, and not listening to their employees. These companies often have the same dreadful ending: executives walk out, employees walk out, and ultimately the company collapses. Success is not about maintaining the status quo or doing whatever it takes to see a profit. Success is staying true to your values as a company. Dreamforce 2018 was a week that rang true to all of these points, and Simplus is excited to reverberate these tenets going into 2019. Want to see all of the fun things that we got into? Check out our recap of Dreamforce here!